At the age of 13, Dr. Doshi had the opportunity to meet and observe the work of Mother Teresa. As a result, Dr. Doshi developed a passion for service. Combining her love of science and her desire to serve the community led her to obtain her dental degree and further specialize in Orthodontics. 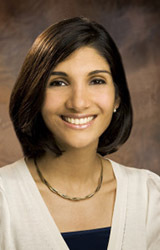 Dr. Doshi’s educational background includes a B.A. in biology and concentration in Philosophy from Illinois Wesleyan University in Bloomington, IL. She returned to her hometown of Chicago to obtain her Doctorate of Dental Surgery (D.D.S. ), Masters in Oral Science (M.S. ), and Orthodontic (specialty) certificate from the University of Illinois. Dr. Doshi completed rotations in the Craniofacial Center learning to treat Cleft Lip and Palate. She was trained in a variety of treatment modalities including self ligating appliances, Invisalign, early treatment and adult treatment. Dr. Doshi and her husband are adventure enthusiasts and are always looking for their next adventure. Her hobbies include hiking, snorkeling, rock climbing and traveling. In 2012, Dr. Doshi and her husband welcomed their first son Remington into their family and, in May of 2014, Remington became a big brother to baby Lochlann. Since then, they have been her most favorite hobby. My daughter was being seen by another orthodontist. When it came time for my autistic son, who had a noticeable underbite, to receive orthodontic care, I thought her orthodontist would be a good fit since they had already met. But after that orthodontist sent us off to the oral surgeon and showed little interest in our concerns, my mommy instinct knew he was not the best person to treat my son. I then contacted another place and asked to see a particular orthodontist. The front desk refused to schedule us with this orthodontist and stated “all of our doctors are able to work with kids with special needs.” Ok, I get it, but not everyone has compassion or patience towards kids with special needs. When I got news about him going to see an oral surgeon, I was in tears and called his primary dentist, who gave me Dr. Doshi’s number. I made that call and it’s the best thing I ever did. The team there is so caring and so easy to talk with. Dr. Doshi is an amazing orthodontist who works really well with my son. She has a very calming and caring attitude and he enjoys seeing her. I never feel like we are just a number and being rushed out of there. My son is receiving excellent dental care and I would recommend her to anyone in a heartbeat. I would like to thank Dr. Doshi and her team for welcoming us into her care and also making us not feel “different”. You and your team do an excellent job! Thank you so very much!